This drill has an emphasis on speed and receiving the puck at top speed and forces the player to do the drill in overspeed. To set up the drill place four equal lines at about the top of the circles along the wall (as shown in the diagram). Depending on the amount of players you can have the two opposite lines go at the same time, this results in four players being active on each repetition. The first player in line will start with a puck a the blue line. The second player will start 3 - 5 strides behind the first player. On the whistle both players explode towards the opposite net. Player 2 will try to catch Player1 from behind until the far blue. If player 1 makes it to the far blue line without being caught from behind then they make a hockey move inside te blue line and take a shot on net. Many times we do this as a warm up for the goalies as well so players are required to shoot from the top of the circles. After the far blue line Player 2 then crosses over without the puck around all four neutral zone dots. The emphasis here is on skating. Players should work on picking up speed with their cross overs. As they come back around to the line from which they started they look for a pass from the line across the ice. They should have a good amount of speed at the point at which they are trying to receive the pass. 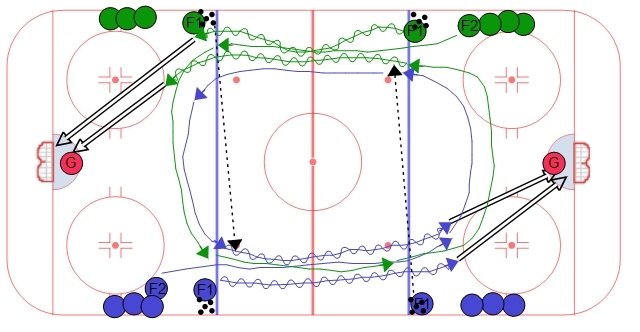 Encourage players to maintain their speed through the neutral zone as they receive the puck. As they attack the zone have them do at least one hockey move before taking a shot from the top of the circles. It is key that Player 2 swing a little deeper into the zone so they can receive a flat pass from the opposite line. If players don't swing deep they will always be looking back for the pass in the neutral zone which is not the best habit.